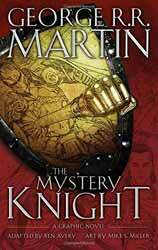 The Mystery Knight: A Graphic Novel (2017. Hardback) presents the story as a full-coloured graphic novel. Harper Collins (HC) has already published volumes adapted from the Game of Thrones, so it seems natural for them to move on to some of the other Westeros material. The story is one of a number which detailed the adventures of Dunk and Egg, the other being The Hedge Knight and The Sworn Sword, the three tales were published as a collection under the title A Knight of the Seven Kingdoms (2015). For this edition HC has gone for a different people to the main novels with the story adapted by Ben Avery with art provide by Mike S. Miller. Avery is an excellent choice as his first professional gig was adapting The Hedge Knight, so he is well acquainted with this world. Miller, for his part, not only worked on The Hedge Knight adaptation, he has also worked for DC, Marvel and Image, as well as helming The Imaginaries, which he both created and wrote. Set about ninety years before the main novels, Westeros is still ruled by the Targaryens, during the reign of Aerys I. Ser Duncan the Tall (Dunk) and Egg travel the land and if you know your Westeros history you will be aware that although both seem somewhat impoverished, this only hides their respective destinies. In the graphic novel we join the pair as they leave Stoney Sept, heading toward the Stark banner who are recruiting men to ward off Greyjoy raiding parties. Along the road they come across a tourney in honour of a recent wedding. The tourney is a draw for Knights and noblemen as the prize is a dragon egg. What follows is a twisty tale of betrayal and egg theft in the great tradition of Westeros where no one is necessarily who they seem and guarding your back is the first thing you learn. The novella has been translated well with none of the central plot lines being omitted. Likewise, the clean lines of the artwork bring the whole thing to life, with the use of the full and multiple panels conveying the dynamism of the fight scenes. Given that they have been adapted from novellas the shorter form allows the comic to retain the pace of the original.